Just a handful of the 30+ Geeks On A Plane (GOAP) who started their Asian field trip in Shanghai, and then moved on to Beijing, Seoul, and Singapore, made it to Japan, the final stop of the tour. 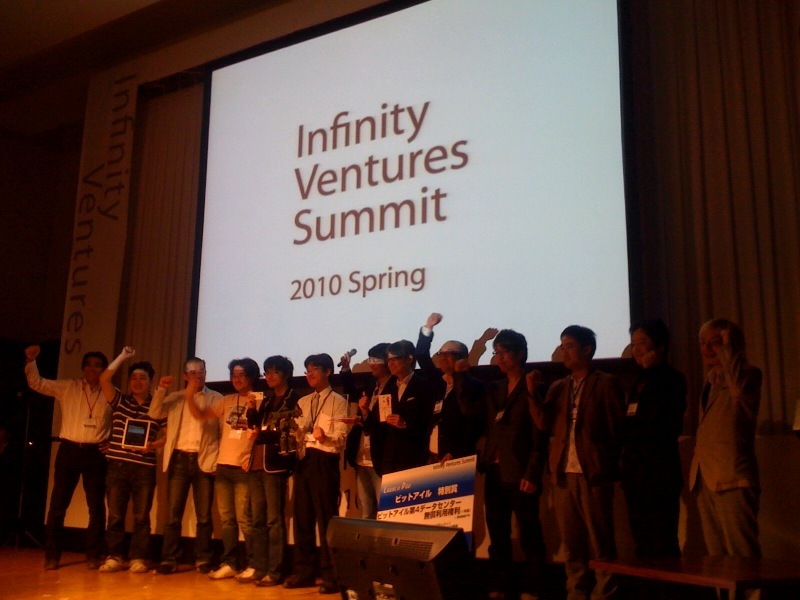 The highlight of the Japan leg was the Infinity Ventures Summit (IVS) in Sapporo [this and many of the following links are in Japanese], a two-day, invitation-only event that takes place twice a year. Organized by VC firm Infinity Venture Partners, the IVS attracted over 400 people from the domestic web industry and a number of international attendees this time. The agenda was filled with panel discussions and presentations on the hot topic in Japan’s web industry today, social gaming. The other current hot topic, the launch of the iPad in this country late last month, was reflected in the launchpad, which gave a total of 11 Japanese startups the chance to demo their products. In the end, V-Sido For Smartphones, a piece of real-time control system software for humanoid robots, won the title of best demo. Best of show went to robot fanatic Wataru Yoshizaki who already made it to second at the last IVS launchpad. V-Sido For Smartphones is a real-time control system for humanoids that turns smartphones into multi-touch remote controls for those robots. For example, if the user draws the shape of a star on the phone’s screen, the humanoid in question does the same in the real world (and in real-time). Move your fingers faster, and the robot will move its arms faster, too. Yamazaki said his future plans include developing a solution of life-sized robots and commercializing V-Sido by year-end. Much like Zopa in the UK, AQUSH is a peer-to-peer lending service that connects people with extra money with those who want to borrow money. Launched in December last year, the site allows lenders to set their desired investment amount and interest rates from 4% to 15% for 5 classes of borrower credit risk, as denoted by AQUSH itself. Loan applicants are screened by AQUSH based on their credit histories, financial situation and FICO scores. AQUSH says borrowers borrow at 11.6% on average (6.5% cheaper than traditional lenders), while lenders can expect a return on investment of 7.8% on loans (compared to 3 year time deposits that pay 0.15%). The goal is to unlock some of the more than $7 trillion of retail cash and bank deposits by offering individual investors access to the $300 billion Japanese consumer loan market. iogous is a patent-pending display ad optimization solution. The tool breaks down each display ad into six components: main visual (for example, a picture), catch phrase, logo, “action button” (for example, “Click here”), format, and background color. iougous can then create thousands of “optimized” banner ads by combining these elements (see some examples in the image below). Fringe81, the startup behind the service, claims customers can expect up to 80% increase in CTR when compared to using traditional, static banner ads (more info in English here). PartyGames is a series of multi-player games developed for the iPad and iPhone. The main idea is to use an iPad as the main screen and then have a group of players use their iPhones as individual game screens, for example to play poker in the real world (the devices are linked via Bluetooth). KLab has so far brought PartyPoker to the Japanese AppStore. “PartyCoupleMatching” (game for group dates) and others (PartyDarts, PartyBowling etc.) are on the way. L+ is a lifelog tool for Android that makes use of four hardware elements: GPS, Bluetooth, accelerometer, and microphone. The tool aims at answering the question what you did at which location, at which time and possibly together with whom. L+ helps you to keep track of how many steps you took at a given day (via the accelerometer), how you moved around the city (via GPS and Wi-Fi), and whom of your friends you met or who’s around (via Bluetooth connection). Activity is recorded for future reference through Google Maps, calendars, and various stats L+ creates while in use. Japanese tech blog Tech Wave offers video recordings of all 11 demos on its Ustream channel (all presentations were held in Japanese).